Is StresStimulus correctly handling GZIP compression? Assume this is not a bug, and is by design, but thought I'd check anyway. When i record my test, its recorded against a site using GZIP, and this records fine. But when playback happens, even though the 'Accept-encoding:gzip, deflate' header is sent, the response shows in Fiddler as uncompressed. Is this just a display issue in Fiddler? Is the tool correctly receiving GZIP content? 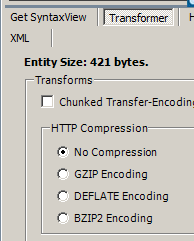 Normally when you click on a request in fiddler that has been through GZIP, it asks you to transform the data before you can look at the response data. Also- when you 'Compare Sessions' the requests, it compares a compressed VS a non-compressed document which doesn't really make sense. If your traffic is compressed (whether during recording or replaying the test case), you can choose to display responses either compressed or decompressed in the fiddler grid, using the fiddler Decode settings, shown below. This setting must be set before the traffic is actually captured. If you need to see the response bodies in a human readable form (for easier troubleshooting/debugging), then it makes sense to display responses uncompressed. By design, Fiddler measures the response sizes after the decompression, so it may not correctly reflect the real payload sent through the wire. Therefore, in order to accurately measure and report the bandwidth in StresStimulus, the Decode option must be unchecked. Thanks to your comment, we will make the following change: StresStimulus will automatically disable the Decode settings during the test run to assure correct bandwidth measurement, and will automatically enable the Decode settings during the verify operation and debug run to make it easier to troubleshoot. In the meantime, make sure that while running the test, the Decode option is unchecked. On your comment about the comparing replayed and recorded sessions. I totally agree with you that only comparing the decompressed traffic makes sense. With the change described above, during the verify operation and debug run the replayed traffic will be always decompressed. To make the recorded traffic decompressed as well, will make another change. StresStimulus will save the recorded test case as uncompressed, regardless of Fiddler settings. In the mean time when comparing recorded and replayed traffic, you can use another fiddler option that allows decompressing responses after they are already received. To do so, selected necessary sessions and in the Inspectors select Transformer tab and choose the “no compression” option. Both change will be released later today (US business hours). I will let you know when it is available for download. Let me know if the changes addressed the issues that you raised.